I get THE coolest emails. One of them was from Seamstress Erin saying she had a pile of fabric that was used in the movie Rambo III and asking if I wanted to participate in the Rambo project. She’d send us the fabric and we just had to come up with a way to make it into a garment and blog about it. The fabric was used as turbans in the movie and we were told, and you might already guess this if you’ve seen the movie, had snags and stains from being, y’know ON SET! So yeah, we were getting about a two yard piece (more or less) of 26″ wide fabric which makes for some need to be a sneaky cutter. I swear I cut around all the stains but I see some on my new skirt. Let’s just say it adds character and what a story! 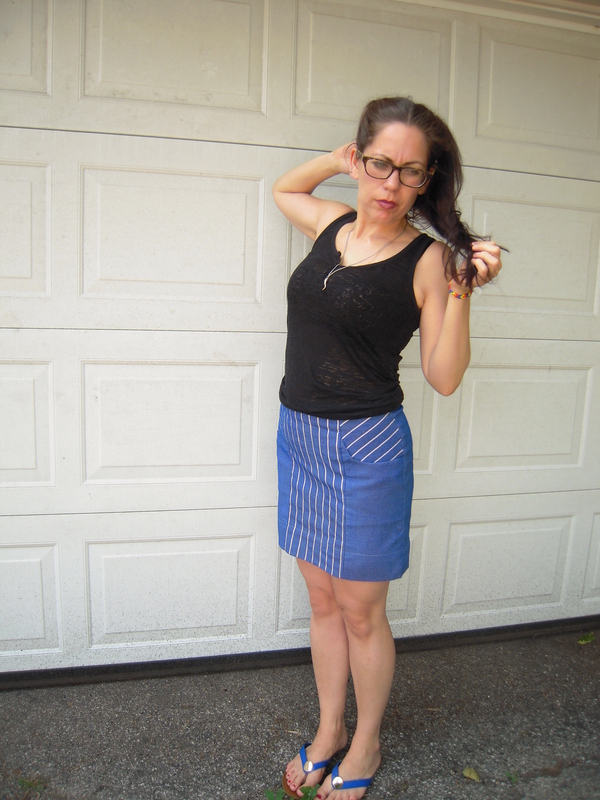 So, I chose the Cake Hummingbird skirt– a pattern I love and really am reminded of how much I enjoy making and wearing it. I started with the size 40 hip and took out a ton on the sides but hey, that worked and I know Steph made the pattern for easy fitting and I’d call that easy fitting. I might try the 35 hip next time, tho. Once you get the pocket sewn together, the skirt is a breeze. And I love invisible zips. They are so fast. So, on to my Rambo Project Hummingbird! So, this piece of turban fabric had stripes on both ends and I wanted to use them in an interesting way. Bias stripes worked for the upper pocket piece! Woot! I feel like a part of Rambo III in a way I could’ve never imagined. This skirt is now a part of movie history. It’s pretty amazing. Thanks Erin for including me! Now, go check out the other Rambo Projects on Erin’s blog! Ahhhhhhhhhh this is awesome! And DUDE, you have a slamming figure! It was really thoughtful to place the stripy ends of the fabric in the way you did. This skirt is übercool! Thanks. I’m pretty tickled with how it came out. So cool! I love the way the stripes are aligned! Hell yeah! It’s the perfect use of stripes. High five fellow Rambo recruit. Thanks baby! I love your bustier dress! So hot! Thank you! Yeah, I love the story. 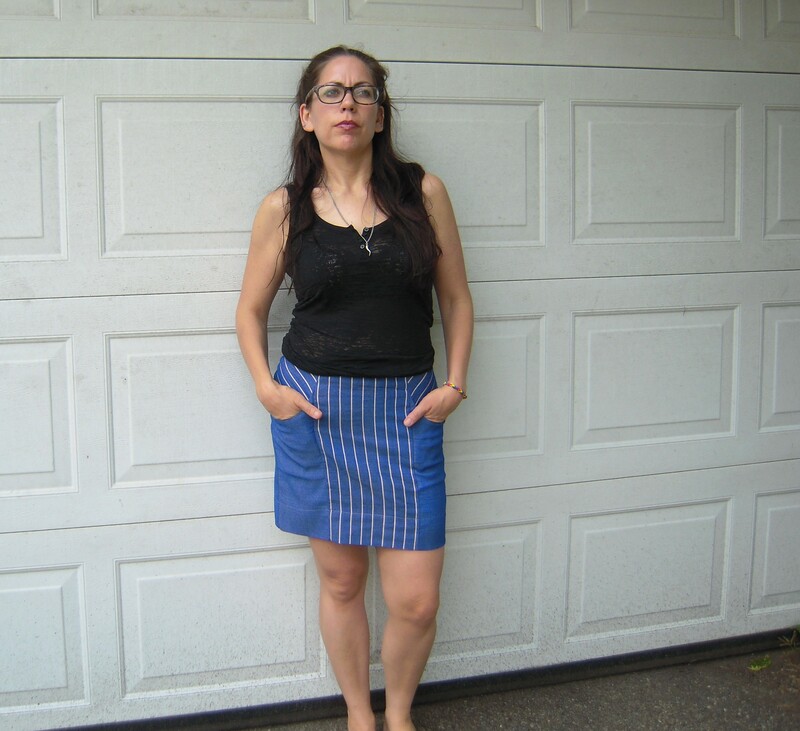 A very cute, very wearable skirt! Thanks! It’s a cutie and I’m loving all the short skirts!